For years, British explorer William Lindesay’s inquiries about a possible extension of the Great Wall in Mongolia turned up nothing, but the researcher recently had a breakthrough. Seeking insight from Professor Baasan Tudevin, a lauded but hard-to-find expert on the region, Lindesay posted an advertisement in a local newspaper. It was a long shot, but the two connected and the Mongolian geographer said he knew of several such structures in the Gobi desert, the Telegraph reports. Lindesay formed an expedition in August and with two Land Cruisers, 44 gallons of water, 12 gallons of extra gasoline and a lead from Google Earth, began poking around about 25 miles from the sensitive Chinese-Mongolian border. Two days into the exploration, his team discovered what is thought to be the first section of the Great Wall to exist outside of China. Lost for nearly 1,000 years, the wall’s 62-mile-long arm is made mostly of shrubs and dirt. Lindesay told the Telegraph much of the wall is about shin-level, but there is also a stretch that reaches up to his shoulders. At first, Lindesay thought the section was built around 120 B.C. during the Han dynasty. However, carbon testing placed the remnants in the 11th or 12th centuries. “Overall, the Wall of Genghis Khan in Ömnögovi appears to be a missing piece of the Han Dynasty Great Wall which was routed through the heart of the Gobi around 115BC,” Lindesay told the Irish Times. Lindesay theorizes that Ghenghis Khan’s third son, Ogedei Khan, built the wall to put a stop to gazelle migration from China. Fascinated by the Great Wall since his first trip to the region in 1986, Lindesay has made a career out of exploring and conserving it. “I have been looking at this area since 1997, when a friend gave me a copy of an atlas showing the red lines of Genghis Khan’s attacks and counter-attacks, and underneath those are the strands of wall,” Lindesay, told the Telegraph. The explorer was awarded the rank of O.B.E. (Officer, Order of the British Empire) in 2006 and is the author of several books including The Great Wall Revisited: From the Jade Gate to Old Dragon’s Head and Alone on the Great wall. Mayan Light Beam Photo: Message from Gods, or iPhone Glitch? “El Castillo,” a Mayan temple on the Yucatan Peninsula in Mexico, with a mysterious “light beam” emerging from the top. CREDIT: Hector SiliezarWhen Hector Siliezar visited the ancient Mayan city of Chichen Itza with his wife and kids in 2009, he snapped three iPhone photos of El Castillo, a pyramid that once served as a sacred temple to the Mayan god Kukulkan. A thunderstorm was brewing near the temple, and Siliezar was trying to capture lightning crackling dramatically over the ruins. In the first two images, dark clouds loom above the pyramid, but nothing is amiss. However, in the third photo, a powerful beam of light appears to shoot up from the pyramid toward the heavens, and a thunderbolt flashes in the background. The photo has surfaced on several Mayan doomsday discussion forums. But was the light beam a sign from the gods — a warning about Dec. 21, 2012, the date that marks the end of the Mayan calendar cycle, and when some people fear the world will end? Or is it simply the result of an iPhone glitch? According to Jonathon Hill, a research technician and mission planner at the Mars Space Flight Facility at Arizona State University, which operates many of the cameras used during NASA’s Mars missions, it is almost definitely the latter. Hill works with images of the Martian surface taken by rovers and satellites, as well as data from Earth-orbiting NASA instruments, and is fully versed in the wide range of potential image artifacts and equipment errors. He says the “light beam” in the Mayan temple photo is a classic case of such an artifact — a distortion in an image that arises from the way cameras bounce around incoming light. Evidence in favor of this explanation is the fact that the beam, when isolated in Photoshop or other image analysis software, runs perfectly vertical in the image. “That’s a little suspicious since it’s very unlikely that the gentleman who took this picture would have his handheld iPhone camera positioned exactly parallel to the ‘light beam’ down to the pixel level,” Hill told Life’s Little Mysteries. 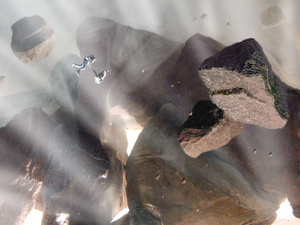 It’s more likely that the “light beam” corresponds to a set of columns of pixels in the camera sensor that are electronically connected to each other, but not to other columns in the sensor, and that this set of connected pixels became oversaturated in the manner described above. 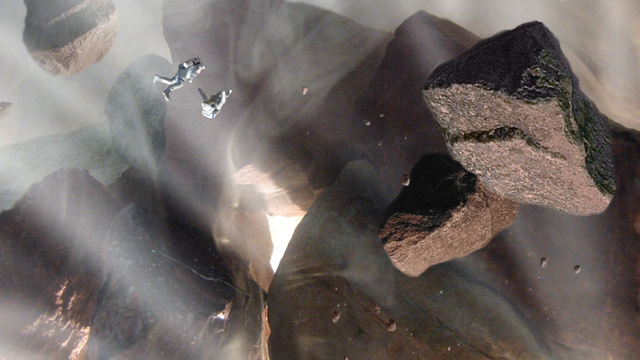 There are some swell places to visit in the Solar System, but there are also a few places that it might be best to avoid. There are some grand vacation places — the rim of Mariner Valley on Mars comes to mind, or the ice fountains of Enceladus — but there are some places that you might be better off just reading about. The Himalayas of Venus, the view of Jupiter from Io, being able to see the entire solar system in one glance from Pluto — all of these have places have some pretty nasty price tags attached. 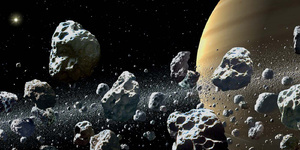 Here are the seven most dangerous places in the entire Solar System. 1. 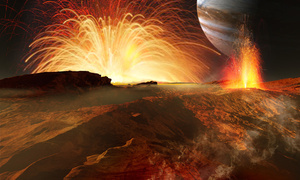 Io In spite of boasting a spectacular view of the giant planet Jupiter, constant volcanic eruptions and huge flows of molten sulfur would make trekking around the landscape a little dicey. Even without the possibility of being blown up or fried, you’d have to deal with a deadly radiation field that would be pouring 3600 rems into you every day. You get about 0.1 rem per year on earth, so you work out the figures. 2. 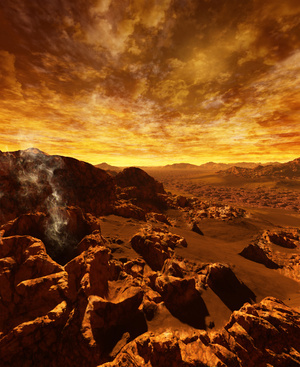 Venus Crushing pressure, sulfuric acid rain, 700-degree temperatures. If you want to see Venus’ towering Maxwell Mountains you better look fast — because it’d be a race to see whether you’d be crushed, incinerated or dissolved first. 3. Just about any comet In addition to an unstable, perpetually erupting surface, it possesses an “atmosphere” consisting largely of gravel. Being on a comet that is “calving” — or disintegrating into big chunks like a glacier — would be worse. Even worse yet: a sun-grazing comet that is disintegrating like — well, like a snowball in hell, as it zooms through the outer atmosphere of the star. 4. The surface of Pluto A surface containing oxygen frozen hard as steel with lakes of liquid neon. On a clear day the sun provides about as much heat and light as a full moon does back on earth. With Pluto’s surface temperature at -378 to -396 F (-228 to -238 C) you’d freeze solid in a nanosecond so it at least it probably wouldn’t hurt. 5. Inside the rings of Saturn Playing dodge-em with 40 zillion icebergs probably sounds like more fun that it really would be. 6. The hydrogen sea of Jupiter You just don’t want to be anywhere near there, trust me. 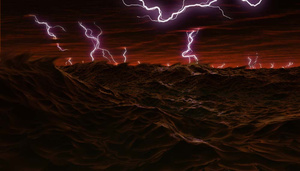 Somewhere far beneath Jupiter’s clouds and the core of the planet may lie a sea of liquid hydrogen, lit only be the glow of titanic bolts of lightning. Below this the pressure continues to rise until ordinary liquid hydrogen is compressed into liquid metallic hydrogen, of all things. 7. 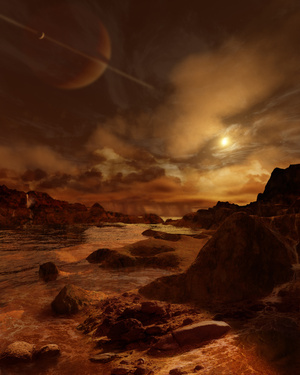 Titan Intense cold and a dense, poisonous atmosphere…and if you needed any more reason to keep the windows and doors shut, it’s an atmosphere which would be explosive if accidentally mixed with oxygen! Nicole Graham holds her horse Astro’s head above the rising tide after he got stuck in the mud. Throughout it all, Graham stayed waist high in the mud, calming the horse through every attempt and holding his nose above the water. Luckily they were able to pull him clear before the tide came in. See the incredible rescue unfold in these photos. Members of the fire department and the emergency services try to free the 1,100 pound horse with fire hoses, then a winch. Making little progress, vet Stacey Sullivan decides to sedate him and pull him clear with a tractor. Astro tries to pull himself out of the mud after his front legs are clear. Headed home! Graham and the rescuers lead Astro away from the beach after he was finally freed of the mud. — This was posted by TODAY.com producer Lisa Granshaw. She loves seeing animal stories with happy endings! Investigators using a robotic arm equipped with a remote-controlled camera have discovered what is being called the earliest evidence of Christian iconography in Jerusalem. The newly discovered ossuary carries a Greek inscription calling on God to “raise up” someone, which is being interpreted as an early reference to the biblical resurrection of Jesus. A second limestone box appears to show the carved image of a fish, which may be a reference to the biblical prophet Jonah. This would be a historical first, as references to the resurrection had not previously been discovered before the 2nd century. “This does reopen the whole question about the ‘Jesus Tomb,” Tabor told MSNBC. Yahoo News contacted Tabor, but is still waiting for a response. In addition to his efforts on the “The Jesus Discovery,” Tabor is also working on a new translation of the Bible, known as the Original Bible Project. He contributed to a controversial TV documentary called, “The Lost Tomb of Jesus,” which received significant attention at the time of its release, since it was produced in partnership with Academy Award winning director James Cameron. The new discovery is actually part of an earlier finding made by Tabor and his team. However, the Israeli government shut down the initial investigation due to protests from local religious groups. A house was built on top of the excavation site, which is now referred to as the “Patio Tomb,” because a patio literally rests on top of the site. Tabor and his team were finally able to receive cooperation from the Israeli government by using the robotic technology to explore underneath the site. 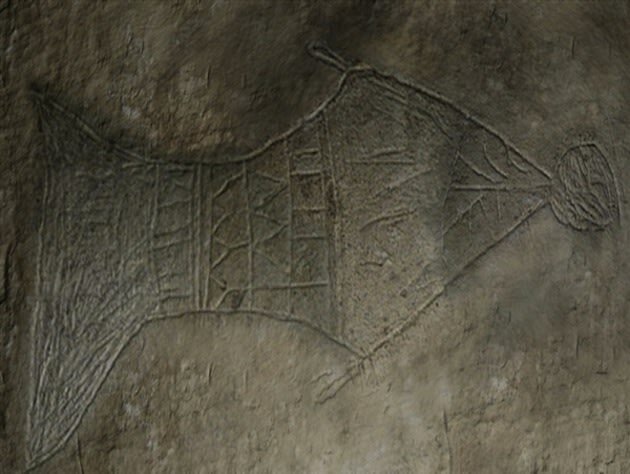 “This inscription has something to do with resurrection of the dead, either of the deceased in the ossuary, or perhaps, given the Jonah image nearby, an expression of faith in Jesus’ resurrection,” Tabor said in the statement, referring to the “raise up” inscription on the ossuary. “We now have the new archaeological evidence, literally written in stone, that can guide us in properly understanding what Jesus’ earliest followers meant by their faith in Jesus’ resurrection from the dead — with his earthly remains, and those of his family, peacefully interred just yards away,” Tabor and Jacobovici wrote. However, skeptics say that Tabor is attempting to connect circumstantial evidence to his larger theory of the so-called Jesus Tomb. “The attempt to connect [the Patio Tomb] to the other tombs is sheer conjecture, unless the tombs were connected,” Ben Witherington, a New Testament scholar at Asbury Theological Seminary, told MSNBC. 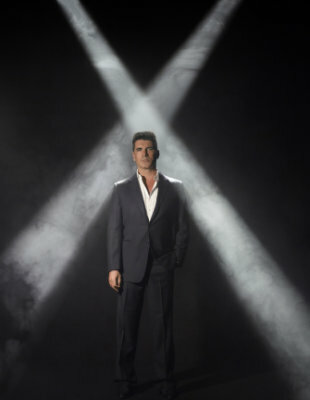 In a new interview with Reality Rocks, “X Factor” honcho Simon Cowell addresses these tough issues. How did Paula take the news of her pink-slipping? Does he still feel bad about what went down with Cheryl? Is he at all threatened by “Idol” and “The Voice”–and was he really serious about that “super final” idea? Is he surprised (or annoyed) that “Idol” survived, even thrived, without him? He answers all this and more. And, even more excitingly, he addresses my entirely serious suggestion that “X Factor U.K.” stars Jedward be hired to host the American version of the show next season. Remember, you read about that idea here first! REALITY ROCKS: So I know you are recasting “The X Factor,” and word is you’re going to have two hosts, not one, next season. Can I make a suggestion for who you should hire? SIMON COWELL: Sure, go ahead. SIMON: [Laughs] Brilliant! You know what, Lyndsey? Stranger things have happened. That is a very, very funny suggestion. I am thinking about it…they are hilarious, those two. What started off as a joke…I mean, my God, the joke’s on us now! These guys are now multimillionaires. That is a very funny suggestion; I will genuinely put that in the pool. And if it happens, I will give you credit. REALITY ROCKS: Deal! Okay, in all seriousness now, you’re not just replacing the “X Factor” host, but two of the show’s judges. Was there a specific moment during “The X Factor” Season 1 when you thought, “This isn’t working out”? When you realized you’d have to wipe the slate clean? SIMON: No, I was happy with the show last year. I was kind of thinking this year, as we all were, what the marketplace was going to be like in a year’s time. And what we anticipated was a big competition between us and “American Idol,” plus the chance that “The Voice” may compete with us in the fall. Plus the change in the music scene, which is we predicted that pop music was going to make a big comeback–you’re definitely going see that starting with One Direction, who ironically were on the U.K. “X Factor,” a boy band who could debut at number one on the album charts in a couple weeks’ time. This is just the beginning, so the show was really gearing up to take all of that into account. And the thing with Paula in particular was that the network felt was that it was still too similar to what we had done on “Idol,” and they wanted to separate the shows further. So it’s sad that we’re losing them, but you hope that the changes will overall make the show do better this year, because that’s all we were thinking about. REALITY ROCKS: You say that the concern with having Paula Abdul on “The X Factor” was it made the show too similar to “Idol.” But wasn’t that the whole idea–that having you two together again on television would play into the nostalgia of fans who missed your old “Idol” era? SIMON: Well, that was the idea. And I loved being back with Paula again. We had a fantastic time, and I had to speak to her on the night [the firings were] announced. But she was very, very gracious and cool and very grown-up about it. But the network felt quite strongly; they wanted to say that those days of me being associated with “Idol” are over and it’s time to see something brand-new. REALITY ROCKS: The original plan with “The X Factor USA” was to have two hosts, with Nicole Scherzinger hosting alongside Steve Jones, before Nicole became a judge to replace another old associate of yours, Cheryl Cole, who was let go early on. Do you ever wonder how the show would have panned out if you’d just kept Cheryl as a judge and Nicole as a host? SIMON: You know what, I’ve got absolutely no idea. I can’t even speculate on what it would have been like, how it would have been different. I mean, it’s still sad now that it ended up the way it did with Cheryl. But I’ve produced shows for long enough that you’ve just got to have broad shoulders when you make decisions like that. And if you made the wrong decision, you take the blame for it. I don’t know if it was the right decision or the wrong decision [to fire Cheryl], but I was part of that decision and I was sad for her. But you know what? Cheryl is a tough cookie, and she looks back on the time she spent within the U.K. show as an important time in her life. She’s now moved on, she’s still a star and always will be, and we’re all going to move on. REALITY ROCKS: You’ve been accused of, or portrayed as, being some sort of backstabber, for firing “loyal friends” like Paula and Cheryl. How do you respond to that? SIMON: There are people who are going to feel that way. I would counter that by saying that [Paula and Cheryl] worked with us on shows for a long time, I’ve supported them, and everyone’s made a lot of money out of it! [Chuckles] So look at it in the real world: That is show business. I don’t make these decisions on my own. Of course, you can fight for people, but you don’t always win the battle. I had to really, really push to get Paula on the show on the first year and I’m glad she did it, as I think it’s been good for her. She’s going to go on now to other things, so it’s slightly unfair for people to say that about me. Because on the back of what we’ve done for these people, they have massive opportunities ahead of them. REALITY ROCKS: There are a lot of rumored judge replacements out there. What qualities are you looking for in the new judges you eventually hire? SIMON: Well, initially it has to be someone who wants to be on the show and isn’t doing it just for a paycheck, because that doesn’t work. They really, really have to be committed to actually finding a star, and when they find one, committed to working with them on a weekly basis, because that’s what were paying [the judges] for. And they have to know that the public are going be interested in seeing a different side of them that they’ve never seen before–which I find the most interesting thing, when you put a pop star on a panel, and you’ve really only seen them in interviews before and it’s been slightly one-dimensional. I try to make the decisions based on who the public is interested in hearing from, and then, can they do their job? And like I said, people who aren’t just doing it to get paid a lot of money. REALITY ROCKS: One issue I have with the judges on “The X Factor” is their favoritism–their unwillingness to vote off one of their own team members for the good of the show, even if their team member was clearly not as good in a sing-off. I think you need a tough judge who has the guts to do that. SIMON: One-hundred percent! I’ve done that, and I would do it again. But you know, it’s like what you were talking to me about before, about people saying I’m disloyal: God, when you do that on the show, you get it in the neck! Big time! But I would say that to all the judges, and I would definitely do it. If I didn’t think someone should be there and someone else is better, 100 percent, I would kick off my own act. REALITY ROCKS: That makes sense–it’s your show, and your record label, so obviously you want the best person to win. SIMON: Well, yeah, that’s the whole idea about making the show, you know. The right person should win. REALITY ROCKS: Much ado has been made about the fact that “Idol’s” ratings are in decline this year. Do you think that bodes well for “The X Factor”–as in, maybe people are tiring of “Idol” and want to move on to a new show–or does it bode badly, because it might mean people are coming down with singing-competition fatigue in general? SIMON: I think with any of these shows, it’s been going on for a long time. If you had said to me 11 years ago that “Idol” would still be number one most weeks, I’d go, “Yeah, right.” Most shows don’t last that long, so I still think they’ve done fine. In terms of “The X Factor,” we replaced “Idol” in the U.K., and every year the U.K. show went on, it got better and it just got bigger and bigger and bigger. And I do believe–otherwise I wouldn’t bother doing it–that that’s what is going to happen with the U.S. show over the years. You make better shows, you get more interesting contestants. So I’m feeling more confident this year than I was last year, because last year we were going into the unknown, and I didn’t know if anyone would accept a new singing contest. But the people who watched it really liked the show, and with the shows I think we’re going to make, you’ll definitely see a better show. There are some changes which our competitors don’t know about yet, which is going to make us look different to them as well. SIMON: No, because I had a long relationship with Fox and we really got on well, and I spoke to them about this because they wanted me to stay. And I said, “I can look you in the eye and say I genuinely think ‘Idol’ is going do fine without me; it’ll be a different show, but the advantage is the show will still do well and now you’ll have a brand-new show in the fall, where you didn’t have one at all before. So this is win-win for you guys.” Looking at the history of what happened in the U.K., I did believe, and I still do believe, that over time, “The X Factor” will do better than “American Idol”–otherwise I wouldn’t have left it. There’s no way I would’ve left “American Idol” if I thought we were always going to be second to everyone else. It’s just not in my nature. I work tirelessly until I get to that point, and then work even harder when I do. You have to have that belief, in other words. REALITY ROCKS: One thing I think sets “The X Factor” apart from “Idol” is it is less whitewashed. In recent seasons, R&B and African-American contestants have been shockingly under-represented on “Idol”; this year, there are only three black contestants, who sing R&B, in the entire top 24. But R&B and hip-hop were well-represented on “The X Factor” last year. SIMON: Well, to be honest, we never really go into it going, “We’re going to end up with this percentage.” We base it purely on talent. And Astro, for instance, was there because we just thought he was super-talented. No other show had put something like him on, but thought we could make him look great on the show, which we did. But I go into it this year with a completely open mind. I mean, I was always accused by some of the people at “Idol” that I hate country music. I don’t listen to it, but when Carrie Underwood came onto the show, I was the first person to say, from the get-go, that this girl was going to sell more records than any of the previous contestants. Because I do know stars. I could care less if she was singing country or pop; she was a star. So I’m open to all genres of music, but it will always be based on, can you sell records? That’s the only criteria, and you never know what mix you are going to end up with. I like to think we’re about as open-minded as you can possibly get. REALITY ROCKS: Speaking of being open-minded, I was surprised that you tweeted that you’d be open to doing a “super final” between the winners of “The X Factor,” “The Voice,” and “American Idol.” It seemed to fly in the face of your opinion about “World Idol” years ago, which you said you didn’t like because it turned winners into losers. SIMON: Well, first of all, the “World Idol” show was terrible. I mean, it was just a horrible show, it just looked awful. Secondly, none of the contestants had really signed up for that, and I don’t think everyone was particularly happy to be put in that situation. And of course, it was the same brand; it was all “Idol.” What I thought was interesting [with the “super final” idea] was that since everyone was already really competitive, “Idol” and “The Voice” and of course “X Factor,” I thought it would be a really interesting challenge to see if they would be up to backing their talent against our talent. And I think the audience would love it. I was thinking that it’s just another level of competition, which could actually help all the shows, because there’s more exposure. But it was probably the most negative reaction to an idea that I’ve ever had! But interestingly, not from the networks. The networks, I think, are probably more pro my idea. And then you have to talk to the guys who actually own the formats, which I haven’t yet, to see if they’d be interested or not. And then, you might see a change of heart. REALITY ROCKS: So if the current champs–Melanie Amaro, Scotty McCreery, and Javier Colon–competed against each other, who do you think would win? SIMON: I would put my money on either Melanie or Scotty. I mean, they’re both brilliant. But like I said, because they didn’t sign up for that, I don’t think that would be fair. I think it would be more fun this year because we don’t know who the winner is of “Idol” or “The Voice” or “X Factor.” If all the contestants bought into it now and they liked the idea, then it would be exciting. But all I was trying to do was add another element to what was going on there, make things a bit more exciting and competitive. Because interestingly, I love the fact that “The Voice” has come out and done well. SIMON: Yeah, I really do! Because I think it’s made us more excited about the fact that we’ve got to work even harder than before. And that you can’t be complacent. So I have a lot of respect for what “The Voice” has done, and I know the producer of that show–he’s a really, really nice guy–and we take everything in good spirit.